Fubo Hill, is a solitary peak in northwestern Guilin and on the west bank of the Li River. Fubo Hill Park is a combination of hill, rivers, caves , rocks, and pavilions which form the epitome of Guilin mountains and rivers. As for the name: in 41 CE, during the Western Han Dynasty, Emperor Guanwu sent General Fubo (also known as Ma Yuan) to conquer Jiaozhi (the ancient name of Vietnam). After several fierce battles, General Fubo finally succeeded, so people built a memorial temple in honor of Ma Yuan. It was said that General Fubo once tested his sword to cut the stone off. Actually, there is no historical document which record General Fubo had been to Fubo Hill, so it is only a legend. In the southern part of the hill is a garden with palm trees, bamboo and beautiful flowers. The Returned Pearl Cave can be entered from this garden. The cave is 4 meters to 6 meters high, 6 meters to 8 meters wide, over 120 meters long and takes an area of over 600 square meters. The essence of the cave lies in the stone inscriptions. The cave contains numerous Buddhist statues which were sculpted during the Tang Dynasty. The number of the statues is 239 and over 400 unfinished statues can also be seen. The treasure in the cave is the carved self-portrait of Mi Fu who was a painter and calligrapher during the Song Dynasty. There is a stalactite stone column an inch off the ground, which is thick at the top and thin at the bottom. The name of the stone column, Sword Testing Stone, is supposedly where General Fubo tested his own sword after his campaigns in Jiaozhi. One-Thousand-Person Pot, placed in a cloister in Fubo Hill Park, weighs about a ton (1,000 kilograms) with a diameter of over one yard (1 meters) and height of about 1 meters. With history of over 300 years, it was once kept in Dingyue Temple which was destroyed during the Second Sino-Japanese War (1937 – 1945). 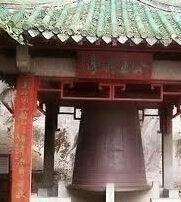 Big Ancient Bell is placed at the entrance of Returned Pearl Cave. With weight of over two and a half tons (2,524 kilograms), it was also once housed in Dingyue Temple.